One of the things I like best about being a jewelry designer is making my own beads. It doesn’t matter whether they are made from silver, copper, bronze, polymer clay, stone, or glass. I find the most satisfaction from using beads I know I can’t get anywhere else. I often combine my own beads with beads and findings made by other crafts people I’ve come to know through blogs and through Etsy. Drilling rocks, waxing and then buffing them takes time. 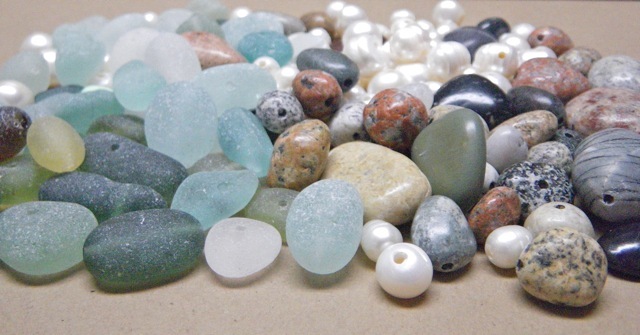 So does drilling sea glass, though when the glass pieces are drilled the beads are finished. No waxing or buffing needed. Enlarging the holes in fresh water pearls also takes time, though I’ve learned to speed up that process considerably by using the same drilling technique I use for rocks and glass. Drilling rocks and glass sounds like tedious business, but I actually really like to do it. A lot. There is great satisfaction when I drill from the opposite side of a stone and connect successfully with the first hole I’ve drilled. I think of how I would like to use each rock as I place it into the dish with the others, waiting to be cleaned up and waxed. So much possibility! 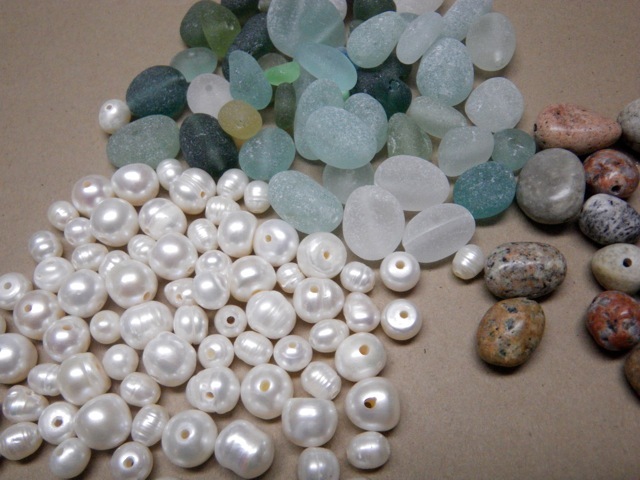 I enjoy spending time on the beach looking for specific shapes colors or sizes of rocks, even though I already have boxes and boxes in my studio that would take me years to drill. 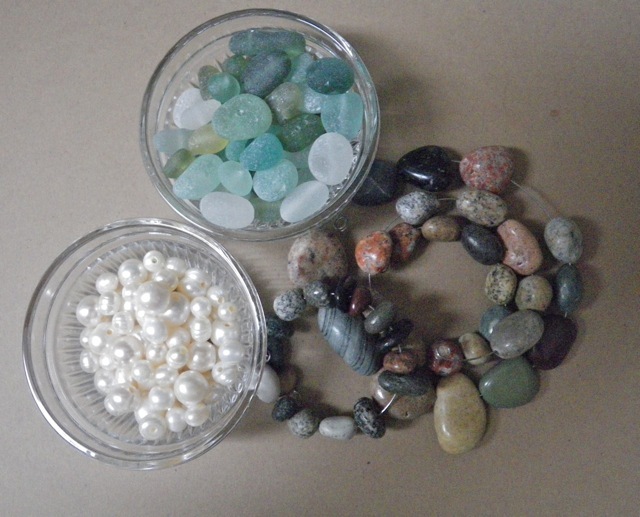 That would be 42 beach rocks, 50 pieces of sea glass, and 75 pearls of assorted size. I can’t wait to start working with them but I will have to. Tomorrow is an off-island day for me. Haircut, visit with Mom, groceries, and time at the Subaru dealer for a catalytic converter recall. But on Friday morning, don’t call me because I’ll be busy at my bench! Oh my…,the pictures of the beads makes my mouth water! Each and every one is just gorgeous! I have never attempted to drill a hole in a bead (yet! ), but I can see how satisfying it is! 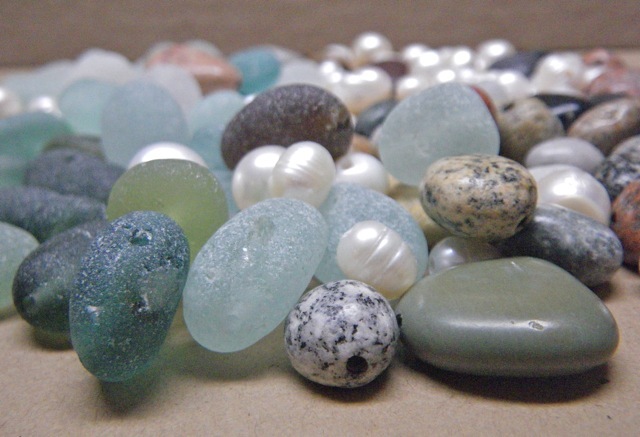 Those sea glass beads have always been my favorites! I’ve been debating about drilling holes in our native stone here. Not as pretty as your lovely beach stones, but perhaps more rustic (and rusty). Your pretty little pile makes me think that perhaps I should give it a try. You should give it a try. Why not?! I’m curious what your native stone is? Happy to share what I’ve learned about drilling rocks.